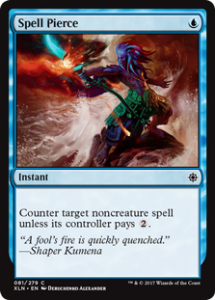 Let’s talk Izzet Drakes. I’ve been playing the deck a lot on Arena in Standard and figured the port to Gentry wouldn’t be so hard as the deck plays a lot of commons as support, where the uncommons and rares act as the payoff. This is a big difference as opposed to porting Golgari Midrange from Standard to Gentry, as that deck is designed to play the strongest individual cards possible, hence a lot of Rares en Mythics as both support and payoff. 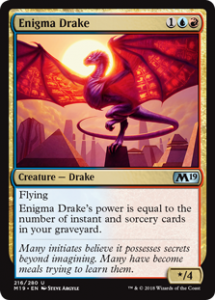 The Izzet Drakes deck is designed in such a way that it works like a hybrid between combo and aggro, with the possibility to sideboard into a control deck. That’s a big draw to the deck for me personally, because you can take a lot of avenues and play it according to your own style. I’m also setting a goal for myself to make the paper version of this deck look as “vintage as possible”. That means playing the Unhinged basic lands, Stronghold Shocks and Invasion Opts. This kind of cosmetic upgrade was an idea inspired by my girlfriend and I’m quite liking it. This is currently the most debated inclusion in the deck. I’ve gotten a lot of feedback from other players and there simply is no consensus about the exact number you should include. It’s been varying between 0, 2, 3 and 4 copies. Eventually, I settled on 4 Electromancer on turn 2 is the most explosive thing this deck can do and I wanted to focus on maximizing that chance. My build also doesn’t play any of the 1 mana cantrips, so Goblin Electromancer has the most upside by making 15 of my cards cheaper to cast. Playing the full playset also allowed me to shave a land or 2. ( The original build had 23 lands) This helps a lot because the deck is very prone to flooding out. Because of the 19 draw spells you see a lot of cards every game, and naturally you’re going to draw more lands than you can place on the battlefield. That being said, I believe I’ve hit rock bottom with 20 lands, as that’s the lowest I would dare to go. You absolutely need to hit your first 2 land drops and after that the draw spells will dig you towards more. Other than the mana benefit, Electromancer is a 2/2 blocker, which helps against the more aggressive decks, and it’s an excellent decoy against the control deck. If they choose to counter your Electromancer that means one less counterspell for your drakes. I do realise it’s a meager topdeck later in the game, but even in that scenario we have a lot of discard outlets to turn it into something else. I’ve ranked these together because there are more similarities than differences with these 2 cards. These 8 cards are you win conditions, your pay-offs, your Hail Mary’s. If these cards didn’t exist, this deck would have no reason to exist. That being said, let’s examine the differences. Enigma Drake is 1 mana cheaper but doesn’t draw a card and doesn’t count the cards in your exile zone. Clearly, this makes this the weaker one of the 2 but the fact you can drop it on turn 3 as a 1/4 means you can start blocking a turn earlier. The biggest difference is in the early stages of the game, the later the game progresses the less the differences matter. Just be careful when you’re calculating your alpha strike. 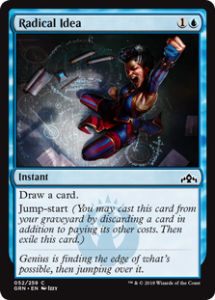 You wouldn’t be the first to Jumpstart a Radical Idea before attacking, only to come 1 damage short off killing your opponent. 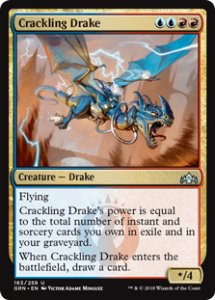 Crackling Drake is the Enigma Drake’s bigger, better brother. It doesn’t matter if your cards are in the graveyard of the exile zone, this one counts them all. Interestingly enough, this has some implications in Modern as well. Ross Meriam just won a SCG Open with 3 Crackling Drakes in his Izzet Phoenix deck. I’ve seen a match where his opponent played Rest in Peace, and it was just blank cardboard as the Drake hit for 12 on the following turn. Opt is the only cantrip in the deck that costs 1 mana, while digging you 2 cards deep most of the time. This is a great conversion rate and I would never start this deck without 4. Some things could be said about the other suite of cantrips though. Do you play Warlord’s Fury and Crash Through or Radical Idea and Tormenting Voice? Those options are all up for debate, but 4 Opts, those are set in stone. Also, have I mentioned the version from Invasion is really beautiful? At first sight this card doesn’t seem to do much but it has multiple good synergies in the deck. The least of which is the Jumpstart ability. This allows you to discard Radical Idea to Tormenting Voice or Chart A Course while still being of use later in the game, especially if Arclight Phoenix is in the mix. Jumpstarting it allows you to turn a dead card in your hand ( mostly a redundant land) into something useful. When you can combine those things with Goblin Electromancer on the board it’s even sweeter because you can do it all for just 1 mana keep churning through your deck. I also ranked these 2 together because the effect is roughly the same. The biggest difference is that Chart a Course gives you more selection over your discard. In most scenarios, when I have the 2 in my hand I tend to start off with Chart a Course first, unless I have an Arclight Phoenix or Radical Idea in my hand to discard. Tormenting Voice is a little better in the later stages of the game because the chances are higher you have some redundant cards you want to cycle away by then. The removal package. Shock is an easy inclusion for a deck like this, 1 mana to kill one of their smaller dudes while also fueling your graveyard with spells is almost the best rate you could ask for. 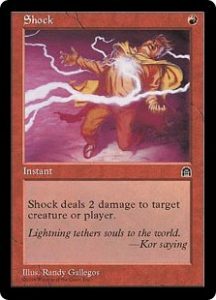 *cough Lightning Bolt cough* While not quite Lightning Bolt I would never leave home without 4 copies of Shock in the deck. 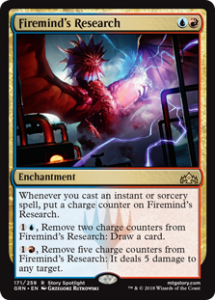 The ability to deal 2 to the opponent directly comes up from time to time, especially if you play a strike-out turn with Niv-Mizzet, and there is also the corner case scenario where you “save” your Arclight Phoenix from a Settle the Wreckage or Ixalan’s Binding. Lava Coil is the catch-all answer, it’s important to be able to kill opposing Drakes and basically everything that Shock can’t touch. Goblin Electromancer turns this into a Flame Slash with upgrade. Also, don’t be afraid to use them early in the game, I’ve killed my fair share of Ghitu Lavarunners and Wildgrowth Walkers with it. The goal of this deck is to survive the early turns in order to land a big Drake and kill them in 2 swings. Lava Coil helps you with that. I used to play 3 copies of Lava Coil and no Beacon Bolt, but I learned to include at least 1 Beacon Bolt in the maindeck the hard way. By getting stomped by Doom Whisperer and big Rhizome Lurchers multiple times. Once again, Goblin Electromancer has a positive impact here, turning your Beacon Bolts into Lava Coils with upgrade. (The upgrade being the ability to Jumpstart them and being able to deal more than 4 damage). 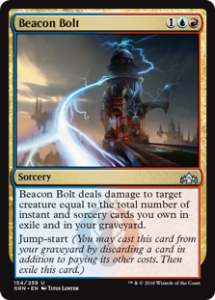 I could see playing multiple copies of Beacon Bolt, but be mindful that it doesn’t do much in the early turns, you need to dump some spells in your graveyard first. For that reason, I’m sticking with the 2-1 split in favor of Lava Coil. Playing 1 copy of Spell Pierce was the input from Niels Viaene. They never see it coming and by playing only 1 copy you mitigate the risk of them playing around it. Also, the feeling you get when you can snipe one of their big counter-plays is just the best. Spell Pierce will also trade up in mana most of the times, which is a great tempo play. Exactly what this deck is looking for because most of the time you kill them in 2 big swings. And if worse comes to worst, there are plenty of ways in the deck to discard it in the hopes of upgrading it through Jumpstart and the draw spells. 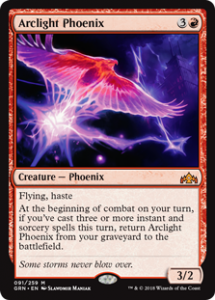 I’m still not sure if this should be a Dive Down or not, considering I also play Niv-Mizzet, Parun but for the sake of this article I went with the Maximize Velocity. It’s the best if you can dump it in the graveyard early on and just let it sit there to scare the crap out of your opponent. The later the game progresses, the more threatening this card becomes. I’ve also had a combo-turn where I played 2 Enigma Drakes and gave them both +1/+1 and haste, just enough to get my opponent from 20 to 0. They never saw that coming. – Arclight Phoenix: Not being able to play 4 copies changes the dynamic of this deck drastically in comparison to the Standard version. If I could I would happily play 4 copies as my 4 rares of choice. Remember Prized Amalgam in the UR Stitches deck? 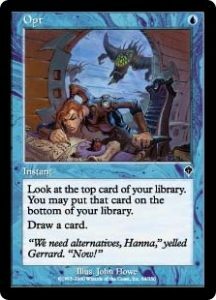 The reason that deck never took off in Gentry was because you could only include 1 Amalgam, which was easily the best card in your deck. Luckily, this time around the Phoenix is more like an added layer to an already strong strategy that works perfectly without it. Needless to say, the hands where you can chain 3 spells on turn 3 to bring back a hasty flying threat are really good. And if you opponent manages to deal with it, chances are big it just comes back next turn. 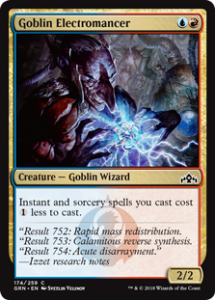 – Firemind’s Research: There is 1 card I like more on turn 2 than Goblin Electromancer, and it’s this one. This has been dubbed as too slow for an engine card but I’ve been using it to great effect in my games. Most of the times you don’t build up to 5 damage but you use it once every few turns to draw an extra card, which in turn helps to fuel it again. There’s also the possibility to just let it tick up and up if you know the opponent has no enchantment removal. Eventually you get enough counters to just kill them with a few activations. In that sense, the card works very similar to Shrine of Burning Rage in Modern. 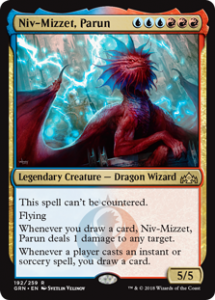 – Niv-Mizzet, Parun: Of course an Izzet deck would not be complete without the leader (Parun) of the Izzet Guild. The big dragon synergizes very well with all the card drawing spells we have and is a natural inclusion in a deck like this. I heard people saying it’s the best card in Standard right now, so not playing it in Gentry would be a big mistake. The inclusion of Niv-Mizzet also allows your deck a combo-like finish without ever needing the Drakes. As an example of this, see the bonus-section below. 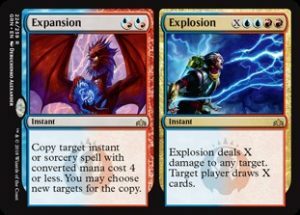 – Expansion // Explosion: This rare could just as well be Ral, Izzet Viceroy but I figured that with 4 Goblin Electromancers I’d much rather play some big Explosions. Expansion could also come in handy from time to time but I found that most of the time you’d much rather wait it out until you can Explosion them for lots of damage. At the latest Gentry Leaderboard in Ghent I started my turn 7 with a Niv-Mizzet, Parun and Goblin Electromancer on board. In that same turn I cast 2 Tormenting Voice, Jumpstarted 2 Radical Ideas, cast an Opt, cast a Shock targeting my opponent and finally played Maximize Velocity on Niv-Mizzet. I then attacked with my 2 creatures. How much cards have I drawn this turn and how much damage did I do (*spoiler: my opponent did not survive). Please let me know in the facebook-link of this article. Hope you enjoyed, till next time! Thijs Weytens used to play the World of Warcraft TCG extensively but since that game got discontinued he started playing competitive Magic, since Theros block. One of his favorite formats is Modern, but Gentry is definitely competing for that spot these days. He’s mostly known for playing the UR Eldrazi deck both in Gentry and Standard, with the latter giving him a 9-4-1 finish at GP Paris 2016. Together with his teammates at Team Wrecking Ball he tries to play competitive as much as possible but when there’s a Gentry event on the horizon you can count on him being present, slinging all sorts of Blue/Red decks.